FREE SHIPPING OVER 250 SF & LOW PRICE GUARANTEE! Cork GO is a floating floor featuring the Wicanders' cork double layer technology which assures you all the benefits that distinguish the Wicanders' products such as comfort, noise reduction, and energy cost savings. A cork floor created for those who want sustainability AND durability at a price that won't break the bank! Its WPS (Wear Protect Surface) varnish provides the floor with a resistance that's suitable for up to heavy domestic usage and a 10-year warranty for domestic use. 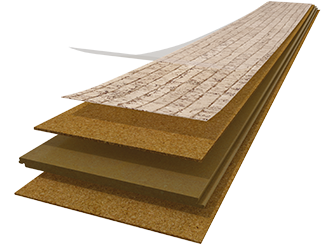 The improved Wicanders 2G Corkloc® floating floor system makes installing their cork floors easier than ever! DOWNLOAD INSTALLATION INSTRUCTIONS or view our Wicanders Cork 2G installation video below. Wicanders' Cork technology combined with the natural properties of cork, provides the perfect match between beauty, comfort and durability. Cork acts as a noise buffer between the floor and the rooms underneath because of its acoustically insulating properties - reducing that noisy foot traffic sound up to 53%. And cork easily cuts noise within a room as well. This is especially beneficial in apartments or other areas more susceptible to outer sounds. Optimal floor temperature throughout the year thanks to its ability to hold warmth. It's thermal insulating properties create a barrier between the cold subfloor and the comfortable temperature of your home. And BONUS...we've noticed the added benefit of energy cost savings because of it! Cork provides a unique comfort in movement, even when walking barefoot, due to its natural softness and flexibility. It's also very forgiving on your legs and back, which is why we like to put it in rooms where you may be standing for longer periods of time, like the kitchen. Or "cushy" as we like to call it. Cork flooring has a long life span thanks to its elasticity and compressibility, which allows it to "give" without damaging the structure. It literally springs back from hard impacts! That means Grandma's china has a much better chance of staying intact when dropped. Cork has been used as flooring in buildings like the Harvard Law Library and the Library of Congress due to its durability. It resists cracking & scuff marks and is airtight to gas and liquid, yet still breathable. When properly maintained, cork flooring can last 40 years or more! Cork (or more accurately, bark) harvesting is an eco-friendly process that's done without cutting down or destroying a single tree. And there are strict time limits on the extraction period. During its long lifetime - upwards of 200 years - the tree is continually regenerating bark, which makes the cork forest industry an ideal example of renewable production. Cork is also a natural fire retardant thanks to its unique cell structure and waxy, fire-resistant substance called suberin. It gives a very low conductivity to heat. And it burns without a flame and does not emit toxic gases during combustion. Cork is a great option for allergy sufferers because it's naturally mold and mildew resistant due to the waxy substance inherant in cork. AND it's anti-microbial. Cork is a healthy alternative to dust and allergen-collecting carpets. Wicanders Cork flooring is a cinch to maintain. Simply sweep up any debris or loose dirt before wiping the floor with a damp (not soaking wet) mop or use a vacuum cleaner. For general spills, a damp mop will do the trick. For deep cleaning, use a mild pH neutral cleaner. We like Cal Flor Eco Clean Floor Cleaner. You have a couple of options here. You can repair the floor by removing only the damaged plank or you can choose to uninstall all the planks until you reach the damaged one. Download the instructions for both options here. MOLDINGS AND TRIMS ARE AVAILABLE TO MATCH - PLEASE CALL 888-447-9877 FOR DETAILS!